This past weekend it was cooler when we woke up Sunday morning, proof that fall is creeping up on us. Which is my absolute favorite season! I began to ponder early that day what I should make for dinner, then I remembered the roast in the freezer. I wanted beef and noodles. So, I made beef and noodles. 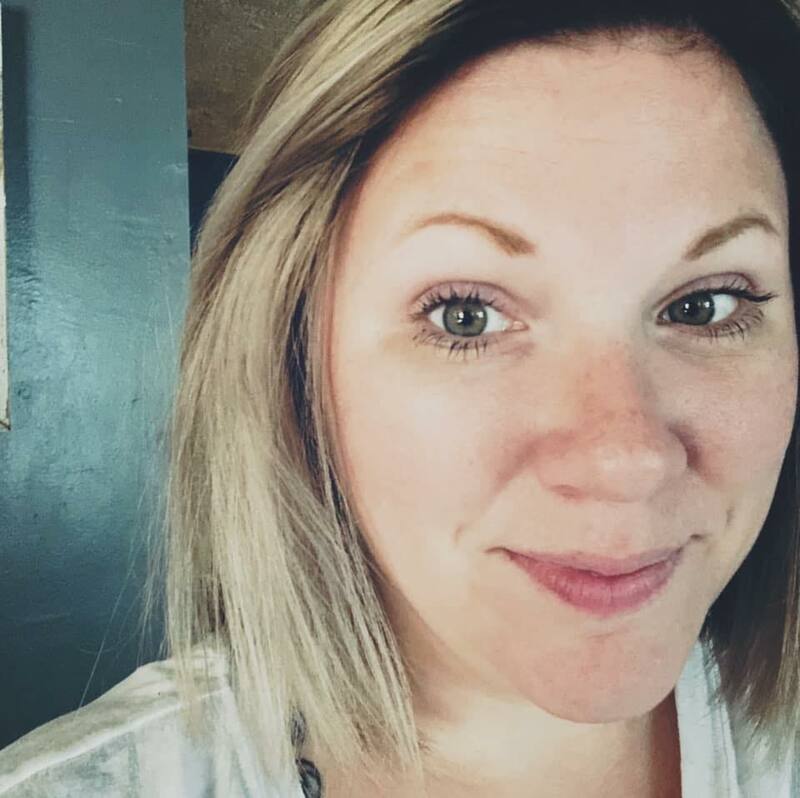 Even though it is my favorite comfort food dish, it is the one my husband hates most of all. I don't know why? It could be that he feels it is a waste of great beef. Or that I made my homemade noodles extra big and thick. I can't help it. I just love my noodles that way! 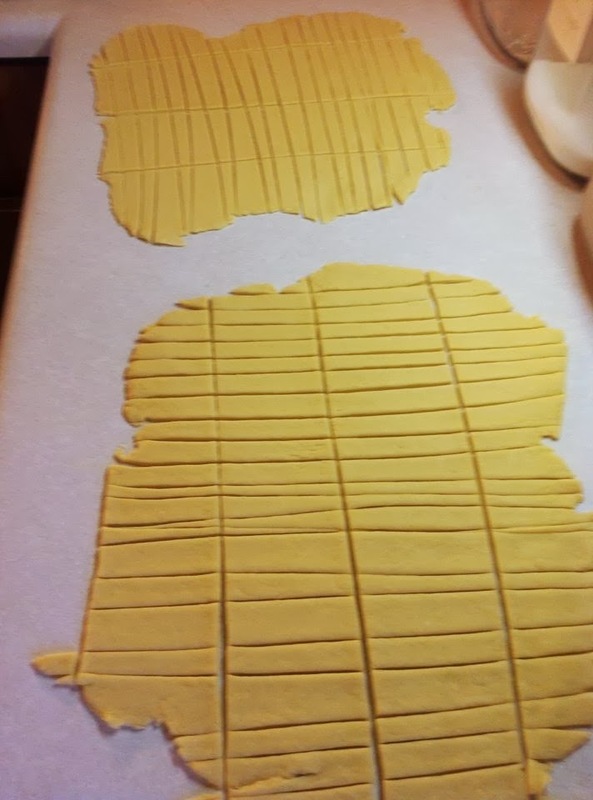 People always think that making homemade noodles is hard work. I don't even flour my counter to roll them out and I slice the dough up with a pizza cutter. After slicing them into strips the length and width I want, I pull them all apart and up off the counter so they dry quicker. If you try to boil them too soon (or your water isn't at a rolling boil) you will have a massive dough ball to try to boil. 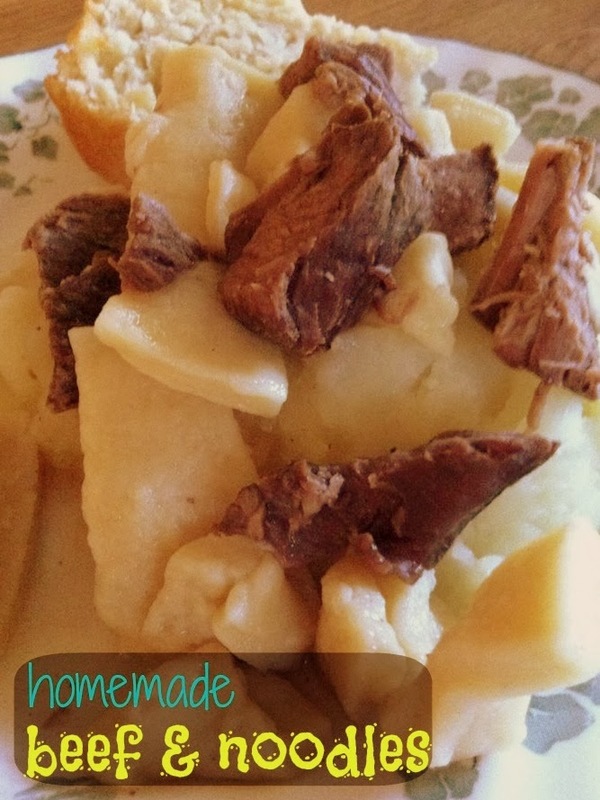 I like to cook my beef roast (this time it was an arm roast - not my top pick, it doesn't get as "fork-tender" as I like, but it works - in the slow cooker all day and shred it up, or cut into small pieces, and place in the boiling noodles after they have cooked. This recipe makes enough for about 8-10 servings, so adjust as you see fit, or have plenty of leftovers! In a skillet over high heat, heat the oil. Salt and pepper the roast and brown in the skillet. Remove from the skillet and place in a slow cooker, set on low. Mix one beef bouillon cube with one cup of water and pour into the bottom of the slow cooker. Cover and let cook for 8-10 hours. Two hours or so before the beef is done, combine all the ingredients together to make the noodle dough. Either mix by hand or in a stand mixer with the dough hook. After everything is well mixed, the dough should be smooth. Separate into two large dough balls and let set for 5 minutes. Roll out each dough until 1/4 inch thick. 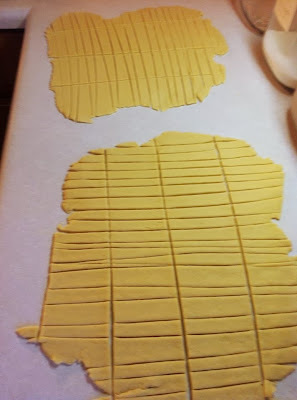 Cut into desired length and widths for the noodles. Pull the noodles up off the counter and toss around, let dry for at least an hour and a half. Fill a large stock pot with water with two bouillon cubes, and bring to a rapid, rolling boil. Add the noodles by the handful, and let cook until al dente, about 7 minutes, depending on the thickness of your noodles. While the noodles cook, remove the roast from the slow cooker and shred or cut into small pieces. Add to the boiling water with the noodles. The water has probably reduced, so add the stock from the slow cooker to the beef and noodles and bring back to a boil. Keep over a low simmer until ready to serve.